Dr. Paul Weiss and his Golden Retriever, Brooke, are making a difference in the dental chair. You arrive with your child at the dentist, your child is nervous and not sure what to expect. And you are greeted by a friendly, loving dog whose purpose is to love unconditionally and ease the nervousness of the patients who visit the office. Talk about making the trip to a dentist a memorable one. Well, that is what Dr. Paul Weiss and Brooke are doing. Meet Brooke. The Therapy Dog. Paul said “it all started with a walk.” He noticed how everyone smiled at Brooke and how Brooke connected with everyone she met. Paul noted that Brooke had a bigger purpose than simply being an incredible family member and pet. He wanted to share Brooke with the world. Dr. Weiss has been practicing pediatric dentistry in Williamsville, New York since 1989, however, last summer Brooke was certified by TDI as a therapy dog and now works two mornings a week alongside his human dad, Paul. Brooke helps people feel comfortable in the dentist office, and for each person this looks different. For some, Brooke lays quietly on the floor. And for others, she has curled up in the chair. Many people saw the photo of Brooke on the dentist chair with a child (see one such photo below) and this photo went viral on facebook, in fact, that was how I learned of Dr. Weiss. Brooke wears a special bandana to work, that way she knows it is time to work. Paul did mention that Brooke amazingly enough knows how to tell time, she knows when it is time to go to the office, what a great alarm clock... love on four feet! 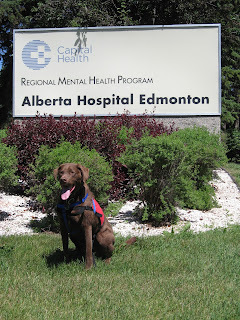 His story is featured in his books On Toby's Terms and Toby the Pet Therapy Dog & His Hospital Friends Toby's story was also featured in a book by Dr. Dawn Marcus. You can see the link below. If you think your dog would make a great therapy dog, speak to your Vet, local behaviorist or trainers or you local Animal Assisted Therapy association.